This is a fab day out! 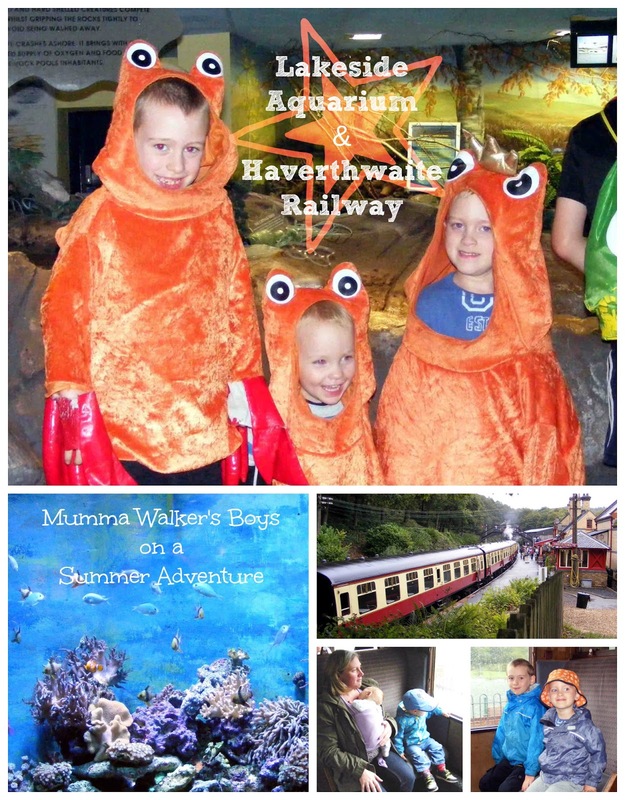 When the boys are bigger and easier to manage (as in i'm not having to carry two of them) I'll take them on the boat too, but for now seeing the fish and animals in the aquarium and taking a ride on the steam train is about as much as I can cope with! Hubby was working today so it was just us with Mamee & Papee. But at least that meant we could all go in the one car! We took the kids round the aquarium first. Jack picked up a quiz on the way in and was determined to win a prize so he made sure he read just about every sign and notice on the way round so he could find the answers. He won a medal for getting them all right! I was thrilled to see the otters this time, which have always been hiding when ever we've come before. Georgie loved seeing the tiny poison arrow frogs, and Jack & Tom thought the tunnel walkway was best. They all had fun looking at the rock pool exhibit and tried to identify all the different creatures. Oh, and they had a go with the dress-up box and posed for a photo dressed as crabs! We got some lunch from the cafe while we waited for our train ride, and it started to pour with rain! Georgie got so excited when the train pulled into the station. He was only a few months old last time we came, and like most little boys his age, he is a big Thomas The Tank Engine fan. I thought he was going to explode with joy when I said we were getting on it! We rode up to Haverthwaite and attempted to let the kids play on the brilliant adventure playground there, but it had rained so hard and everything was so wet that the kids were soaked in matter of minutes. So we took shelter in the coffee shop and ate scones until our return train arrived to take us back to Lakeside.